There’s no bigger scalp than the ladder leading powerhouse Buckley Ridges. The Bucks have been the pacesetter all season, a side never out of the game despite whatever mountain they may climb. For Berwick, defeating the Bucks on day two of their clash at Arch Brown Reserve will inject the belief that they can match it with the best, and more importantly, stay right up to their necks in the race for the Turf 1 flag. On paper, Matt Chasemore’s group is as talented as any; it’s just been about clicking into gear on a regular basis that’s been the issue. But perhaps this result will shape their season, as it’s the cricket that’s been expected from them all year, and in years previous where they’ve just missed out on the mark. After setting the powerful Bucks’ batsmen 263 for victory after Nathan Pilon’s 79 the previous weekend, a lot would need to go right to contain the visitors. Daniel Watson (23) looked ominous early, but he fell first after being trapped LBW by Cory Bevan (39), and from there, opener Jayson Hobbs also fell shortly after leaving the visitors 2/41. Fresh off a freakish Twenty20 century only days earlier, captain-coach David White (48) picked up where he left off, riding the momentum of the home side to consolidate the innings with fellow star Greg Todd (30). After copping some tap early, rising young spinner Isaiah Jassal (1/23) snared arguably the most important wicket of the match, breaking through the gates of White to send him packing only a few runs away from a half century, and for only the fourth time in nine innings in the DDCA. Brendan Rose (1/34) struck shortly after, snaring Todd, before the Bears – courtesy of a ripping spell through the middle from Bevan – saw the visitors slump to 8/154. Despite another youngster in Zarak Aseel (20) giving the visitors a glimmer of hope late, the Bears rallied to consolidate their spot in fourth by finishing them off on 190, in what could be a decisive victory as they look to shore up a finals spot in the coming weeks. 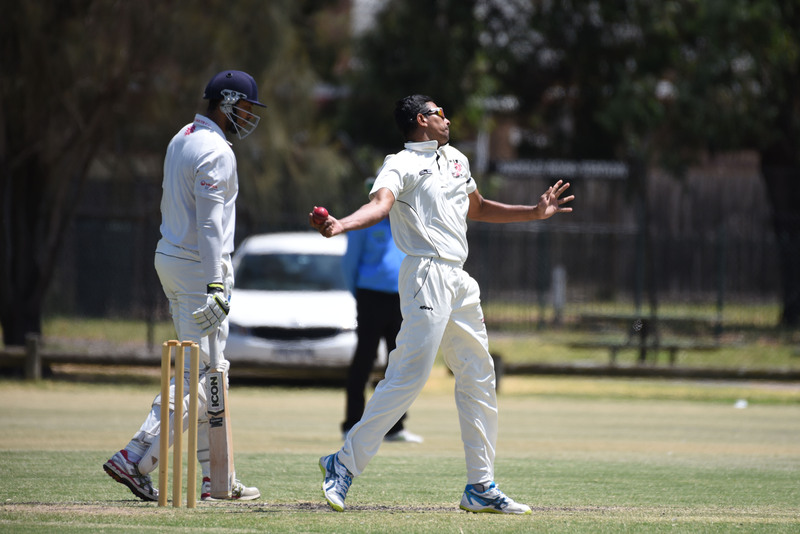 Springvale South, meanwhile, had little trouble in racing down Heinz Southern Districts’ first innings total, surging to a barnstorming seven-wicket win. The Bloods were set a modest 204 for victory, and largely were untroubled, with the aggressive Nathan King (100 not out) guiding the home side to the points in just a tick over 40 overs. Gun spinner Suraj Randiv sends one down for HSD. King blasted 15 boundaries in his 128-ball stay to be the match-winner as he continues a fine season that has now netted him 459 runs at 45.9, while Michael Vandort (45) and Matt Wetering (36 not out) also got in on the act to completely take the game away from the Cobras. 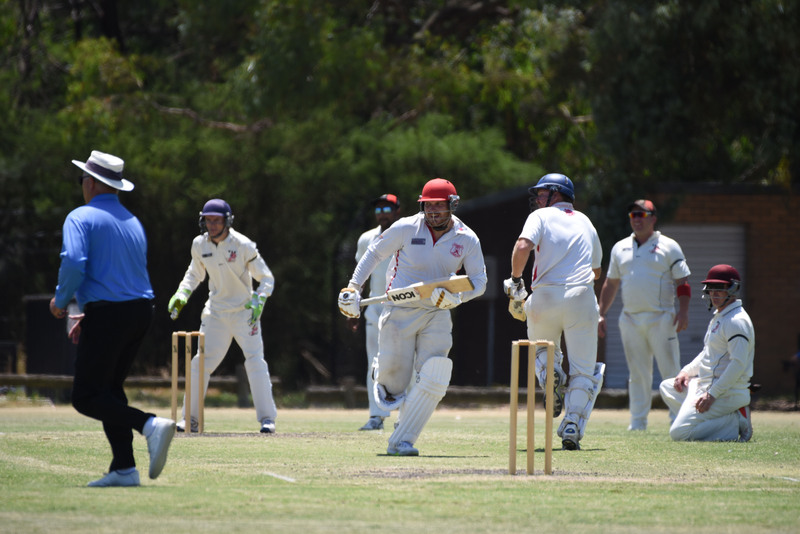 Hallam Kalora Park also maintained their stunning form after already defeating Mordialloc on first innings the week prior, finishing just short of an outright win. The Hawks resumed at 3/91, and despite losing classy top-order bat Ben Hillard (44) early in the day, kept batting to 8/190 after Jagveer Hayer (47) and skipper Ciaron Connolly (33 not out) racked up a 68-run stand to give themselves plenty of runs to work with as they scrambled to roll the Bloodhounds again. The Bloodhounds looked like a certainty to fall to an outright defeat after the Hawks declared, quickly finding themselves 4/9 and then 5/27 after Jordan Hammond (3/53) and Will Whyte (2/25) completely dismantled the top-order in a stunning display of red-ball bowling from the star opening pair. But some late fight to superstar Nuwan Kulasekera (68) – who crunched the ball to the boundary four times and three times over the rope – and keeper Harrison Scott (26 not out) ensured the Bloodhounds could fight to 7/131 at stumps, but still with a loss that leaves them six points out of fourth spot. And St Mary’s gave themselves the best possible chance to break out from the bottom of the table after smashing North Dandenong at Lois Twohig Reserve. The Saints resumed day two 0/18, chasing the Maroons’ lowly 141 for victory, and immediately got things going with a fine opening partnership between Wendyl Pires (43) and Rhys Serpanchy (52) netting 100 runs. The Maroons rallied through their skipper Asfan Thajudeen (2/25) to pick up three quick wickets and leave them with just a sniff, but Saints captain Kaushalya Gajasinghe (51 not out) and Luke Davis (51 not out) passed the total with ease, finishing on 3/210 off 73.2 overs when stumps was called.